Palm-coated work gloves offer the ideal blend of protection and comfort for light work in oily, damp or dry conditions. Featuring a polyurethane palm on a breathable, seamless liner, the Portwest Black PU Palm Gloves A120BK offer excellent abrasion resistance and great tactile sensitivity and grip. This makes them ideal for intricate tasks where a high level of dexterity is required, such as mechanic work. Designed with ergonomics in mind, the Portwest A120BK feature a fine 13 gauge liner for a perfect fit. Completely seamless and highly breathable, it allows the glove to be worn comfortably in warmer environments without reduced levels of protection. At the same time, the PU palm coating ensures excellent handling and protection properties, while allowing the rest of the hand to breathe. 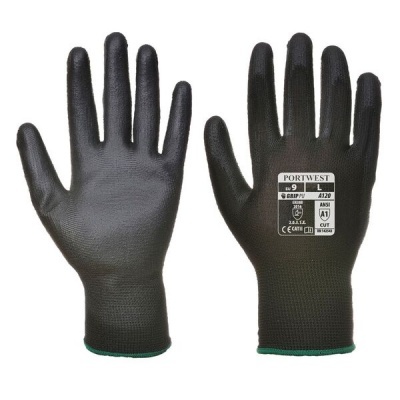 The Portwest Black PU Palm-Coated Work Gloves are available in a range of sizes. Please measure the circumference of your hand around the knuckles (excluding the thumb) with your hand open and your fingers together, and the length of your hand from the tip of your middle finger to your wrist.